Two Yorkshire factories try to tackle the housing crisis with modular two and three bedroom homes. Ready-made homes by Ilke Homes can be constructed in just 36 hours and delivered around the country in a bid to tackle the country’s housing crisis. Their factory in Yorkshire, will eventually create eight fully-fitted houses each day. The homes will come with a kitchen and bathroom and a two or three-bedroom house will cost between £65,000 – £79,000. This excludes the cost of land, assembly and connection to services, which could eventually double or triple the final price. At the opening of the factory in Yorkshire, housing secretary James Brokenshire, said: “the factory would help the government reach an annual target of 300,000 new homes in England. Last year nearly 220,000 homes were built in England. “This is about challenging the ways we have done things in the past. We want to see 300,000 homes being delivered by the mid-2020s, so we need to scale up and build more, better and faster. And that is precisely what this facility is about”. Rather than the out-dated term ‘pre-fabricated’, modern day companies use the term ‘modular construction’. The company’s website explains how their expertise is ‘low-rise houses and apartments of up to four storeys’. These will provide much-needed family housing across the UK. They also claimed that the modular homes typically cost 20 per cent less to heat than traditionally built brand-new properties and half the cost to heat of an average UK home. Houses have been constructed in as little as 36 hours, but one to two weeks is a more likely target when homes are installed around the country. 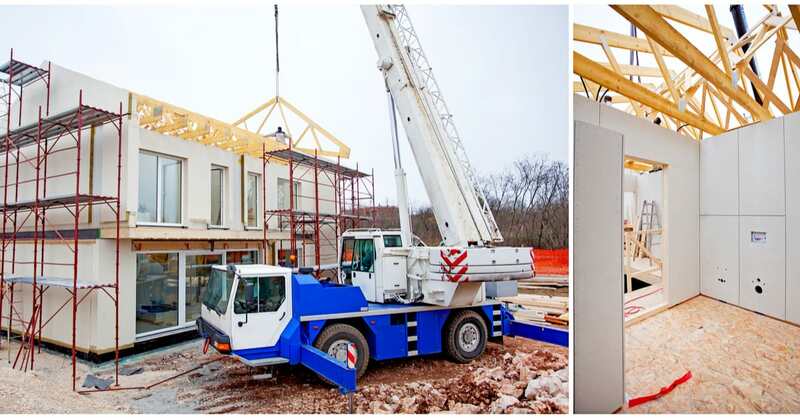 At Europe’s largest housing conference in Manchester in June two properties were constructed in less than 48 hours showing how fast construction could actually be. This means that the 40 weeks that it normally takes to build one house could be dropped to just 10 days. Björn Conway, CEO of Ilke Homes said: ‘We’re on a mission to help solve the UK’s housing shortage, so have set ourselves an ambitious target to deliver 2,000 modular homes a year within two years with our partners. Ilke Homes are not the only company to produce prefab style homes. Insurance company Legal & General have also built a 550,000 sq ft factory in Elmet, near Leeds and hope to build more than 3,000 homes a year. Housing associations and councils were the first to purchase these houses, which can be order in bulk. And they are not ultra-modern homes either; both Ilke and L&G’s first run of production-line homes follow traditional designs. Rosie Toogood, of L&G Modular said “Our homes come fully fitted with kitchen, bathroom, plumbing and electrics all included. They are ready to inhabit almost immediately. But because of current customer tastes, we add a brick facade to the front on site. That can take a few weeks. Our customers want traditional homes with normal slated roofs,”. Speeding up a home purchase will put pressure on all aspects of the process. Buyers will need to ensure they are up to speed, Conveyancing Supermarket can help with fast and free conveyancing quotes. If you are new to buying a home we have a wealth of useful advice, hints and tips to help you move home smoothly and keep the costs down.